When it comes to beautifully designed and constructed vessels, the 47' Riviera Flybridge Cruiser is in a class of it's own. From their attractive lines to the beautifully appointed interiors, these boats are tough yet extremely comfortable machines for cruising the coast or offshore, fishing the shelf. Powered by twin Cummins QSM11 diesels, you have power, reliability, fuel economy and range at your fingertips. 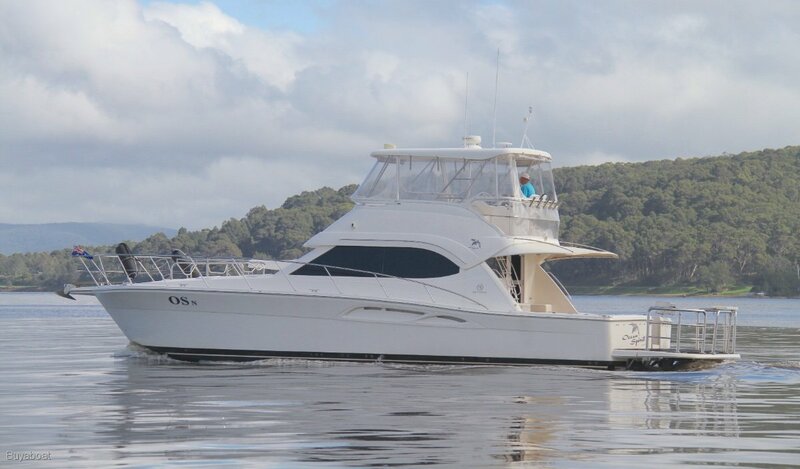 Flush with systems, spending time aboard is guaranteed to be comfortable and enjoyable. Cummins QSM11 660 hp electronically controlled diesel engines. All controlled via twin disc EC-200 electronic controls with select able trolling control. Full service history. Step down galley located in the main saloon with granicoat counter tops, full sized refrigeration, double burner stove, dishwasher, microwave oven and large amounts of storage. 2 Burner electric Fisher and Paykel stove top. LG Microwave. Convection oven. Stainless BBQ. Double master stateroom forward with fully equipped ensuite, TV, Stereo, opening hatch, A/C and excellent storage. Port midships cabin has a double bunk, opening hatch, A/C and great storage including hanging locker and washer/dryer. Starboard midships cabin has a large double bed, leather lounge, A/C and great storage also. Riviera full bedroom bedding sets, pillows and bed covers. 2x Vacuflush toilets in enclosed heads. Near new clears on flybridge and full cockpit shade covers. Muir electric anchor winch with chain counter, plough anchor and chain. Attractive, large volume flybridge cruiser that ticks all the boxes. Many extras, including large hydraulic swim platform ($60K option). Everything maintained to a very high level with full service history available. Antifouling and engine service booked and shall be completed prior to sale.